This Kota Bharu Travel guide will help you to get around with useful information and travel tips. Kota Bharu is the capital city of the State of Kelantan. It’s an Islamic state. The beautiful people are very warm and gentle.Alcohol is officially out of order in this State. So, if you are in for an alcoholic drink in your hotel, then you can forget it. It’s simply not sold in public buildings. But, however, you will find Chinese, which are living in Kota Bharu, who will sell you beers silently. Kota Bharu is a real typical Malaysian city. It’s still so pure. Kota Bharu means “new city/new castle”, and this serene and peaceful town offers both rich tradition and some magnificent natural wonders. Life here proceeds at a leisurely pace, and the time honored tranquility of this unique locale is well worth discovering. Some people think, that Kota Bharu is worth only a stay of one night! Don’t do that. I think it’s the nicest city, that you’ll find at the East Coast. There is so much to do and to see in and out of the city. Don’t just stay in the city, but make trips into the surroundings. You’ll find wonderful temples, large Buddha’s which is peculiar because there are more than 30 Buddhist temples throughout Kelantan. Mostly near the Thai border. This is a surprising number considering Muslims make up 95 per cent of the population. Explore the beautiful caves. Make a boat trip up the river, which departs in Kuala Krai. 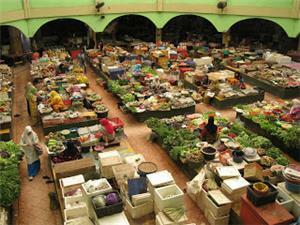 This lively market sells fresh vegetables, fruits, fish and meat, and always has a bustling, vibrant atmosphere. Something special to look for are Kelantan’s famous lekor (dried crackers) – which are plentiful on the upper floor. You may also notice many of the vendors are women, this fact has contributed to the rather false rumor that Kelantenese men are lazy in nature. Kota Bharu has also very beautiful beaches. The most famous one is the beach of “Beach of Passionate Love”. Strong currents make swimming hazardous here, but people happily stroll along the beach enjoying the cool breeze or taking refreshments from the many seafood stalls. You will reach this after a train trip of 2.5 hours and the waterfall is 120 meter high. Kota Bharu is known as the Cultural City, a town that is most “Malays” in Malaysia. It is the centre for Malay culture. It is the place for you to sample the Malay traditional culture, crafts and religion. 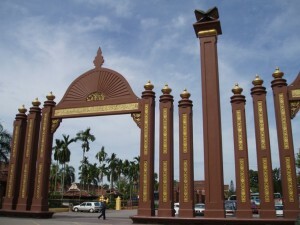 In 1993, The National Land Agency of Japan awarded Kota Bharu as one of the Best 8 cities in the world based on cultural uniqueness and the best tourist destination. The town of Kota Bharu was built by Sultan Muhammad II in 1844. After 150 years, Kota Bharu still serves as the administrative centre of the state, bustling trade, and cultural activities. Something of the identity of Kota Bharu, the capital of the peninsular Malaysian state of Kelantan, can be gleaned from flipping through the phone directory. In just over seven hundred pages of names listed in the directory, nearly ten percent begin with the name Mohammed and another five percent begin with the name Abdullah. Where this pattern is contradicted most noticeably it is with names like Chen, Low, Lok, and Wong which are also heavily represented in the book. Kelantan is the only state in Malaysia not run by the ruling party. Instead it is run by an opposition party which has assured that Kelantan is the most noticeably Islamic state in Malaysia. According to some it also means that Kelantan has suffered and neglected from the ruling party in Kuala Lumpur who is punishing the Kelantan people for voting the opposition party into power. Besides that, you will find more information in this Kota Bharu travel guide. In the northeast part of the peninsula you will find the city of Kota Bharu. It is the first city you arrive at if come from the east coast of Thailand. It is not only the capital of the state of Kelantan, but also a very islamic place. If you want to experience some rather unspoiled Malay culture then come to this city. There are some nice attractions to explore as a number of museums, the nice central market, a few okish beaches and a number of waterfalls and Thai temples. Kelantan, which translates as the “Land of Lightning” is a veritable treasure trove of delights rustic fishing villages, verdant padi fields and languid, palm-fringed beaches. Tucked away in the north-eastern corner of Peninsular Malaysia, the people of Kelantan have managed to keep alive age old customs and traditions, thus earning the state a reputation as the Cradle of Malay Culture. Kelantan’s history dates back to between 8000 to 3000 B.C.Kelantan’s economy is chiefly agrarian with the land yielding padi, rubber and tobacco. Fishing along its 96 kilometre coastline is also an important economic activity while livestock rearing is gaining importance. Cottage industries which employ traditional skills such as batik-painting, woodcarving and songket weaving are also evident. In recent years, tourism has also become a major money spinner. Kota Bharu, the capital, is the major urban centre but there are plans to open up the southern portion of the state under an ambitious multi-million dollar development project. For more information about Bus to Kota Bahru, check out details from us today!